I felt good going into this race, but also went in with little expectations. The Island Series had taught me that no matter how well my training was going, race day can yield different results. I also had begun some longer distance training (up to ~28k) in preparation for a summer marathon, so I knew covering the distance should be manageable. The race started well, and the rain was coming down hard. I tried to begin slightly slow, and settle into a steady pace. I was excited that around the 3k mark, Chris Callendar jumped out of the spectators and ran with me. I actually had forgotten my watch for the race, so it was awesome having Chris telling me my split times, which were consistently ~4 min/k. Chris paced me to the 11k mark, and then rejoined me around the 13k mark. He would stay with me until ~km 20, and was totally encouraging. I knew my pace was decent, and I was pretty impressed with myself how well I held it together. I was even able to pick off about 3 guys in the 2nd half of the race. I don't think I slowed down at all. My racing flats did the trick, and I hammered this 1/2 in a time of 1:23:12. It was a new PB for me, and I was so excited that I performed at this level. This, to me, seemed way more consistent with the training I had been putting in. 16th overall, 4th in my age group. Super excited about this one. Well, and so it goes that actually continuing my blog in 2011 didn't really happen. There were just way too many higher priority things in my life that took up the time. Therefore, I will try and provided a brief snapshot of my year thus far. The year started off with me racing in 6 of the Island Series races. My goal in 2011 was to focus more on the mid-distance stuff, and leave the long stuff out for a while. While my times were good and fairly consistent, I was slightly disappointed that I was unable to PB at any of the distances. I was consistently ~45 seconds slower in all the races. I felt great about my races at Hatley Castle & Merville, but the others felt a little sluggish. I say this because I felt that my training was pretty damn good, especially at the TNWs where I was kicking derriere for most of the season. However, I did accomplish my goal to do well in the standings, and I was pretty excited to come 3rd in my age group, 38th overall - good enough to win a free t-shirt :). Next year, it would be nice to perform as I did in 2010, but I think sleep and stress have a direct corrolation with my performance. I went into this run thinking I was in pretty good shape. After being injured in the late Spring, I fast-tracked into a hefty endurance training program, specifically for this trail run. In all, 12 runners would show up on the day. 7 from the mainland, and 5 from the Island. This number was somewhat disappointing when you consider the initial e-mail interest in the early summer. It looked like there would be in excess of 30 runners. However, having others around was not really why I was here this day. The day began early as usual. I was up at around 4 am, and I already had all my gear ready to go. I wasn't overly impressed with my 4 hours of sleep the night before, but when I had a family wedding up in Duncan, what else can you do? I drove my dad's blue truck out to the China Beach Trailhead, and it wasn't too long before people began arriving. Most of the group left at around 7:45 am. They had chose the traditional South to North option of doing the trail,but I had opted for something different this year. I would be going North to South, and as luck would have it, I would also be doing it solo. On the drive up to Botanical Beach, we saw bears on the side of the road about 10k along, so that got my West Coast vibes flowing inside of me. I dropped my co-pilot, Jeremy Lawrence, off at Sombrio (he was doing a 25k option run back to China Beach) and then continued up to Botanical. From Sombrio on, the road has been newly paved, and it is nice. Far nicer than the roller-coaster road it used to be. I parked the vehicle, got my parking stub, and began my run at the 47k marker right at 8:30 am. This was it. This was what I had been training for all summer. This day. And here I was. The first kilometre was rather simple - a downhill rocky road to sea level. From here the trail cuts South and is more or less flat. I rocked out the first 2k in 9 minutes and I thought to myself that if I could just maintain this pace for the next 45k, I'd have the course record. Haha. Things don't work that way. After the first 2k, the trail takes on more of a JdF flavour. Hills, stairs roots and scenery. This part of the trail resembles the WCT in appearance. However, I was feeling great in the early going and did extremely well to cover the first 7k in 45 mins, and the first 10k in 1:02. At this point, I remember that Sean Chester last year did the final 10k in 1 hour going the opposite way, so I was happy that I was going fast, but not overly fast. Soon thereafter, I saw a hiker coming the other way who flagged me down. He told me that up ahead in 1.5k, there was a large wasp nest on the trail. I asked him if there was any way around the nest, but he said no. He said he got stung. Deep down I have always had a fear of bees. Snakes and spiders, no problem. But bees, I am scared of them. Maybe it is the fact that I know I cannot really outrun a bee. So continue on, keeping my eyes open widely in case the man didn't know how far 1.5k really is. And then I see another group of hikers approaching. I stop. They tell me that their entire group was stung multiple times, and the lady in their group was stung 8 times. She said they were angry. So now I am petrified. I got them to describe exactly where the nest was, and within a couple minutes of running, I hear buzzing sounds, and I totally panic. I scream backwards on the trail 20 ft and look up at the trail ahead. I am cold and have goosebumps of fear. I look up and see a small swarm right in the middle of the trail. Looking left of the trail, I see a 10 foot wall of salal. On the other side, a steep cliff. There is no option here but to go through it. My worst fear is about to be realized. So after a couple minutes, I decide on the Usain Bolt approach. I am going to hammer over this thing so fast that I will be stung the least amount of times. So off I go, and I went hard. I get about 4 feet away from the swarm and then leap over the thing, planting my left foot at the base of the salal wall for extra propulsion. With my eyes shut, I leap over the nest and cannot believe my good fortune. I didn't get stung. My heartrate is high and the adrenaline is going. But I guide my body back into the rhythm of the trail, and before I knew it I was leaving the trail for the top end of Sombrio Beach. 17k down, 30k to go. And I'm actually feeling great. Although normally the beach is a welcome relief from the trail, I was anticipating a better time on Sombrio. Although the tide was out, the boulders were slippery, so it forced me to slow right down and travel slowly. I wanted to use the slow pace to refuel, but the footing was so dodgy that it was quite some time before I was able to take in my gels and s-caps. I also had a peanut butter and jelly sandwich at the South end of Sombrio, and I also was so buddy with my nutrition that I missed the trailhead off the beach for a second. So back onto the trail I go, knowing that I will stop in just a few minutes at Sombrio Waterfall. I have this landmark pegged as a refueling station, and it did its job well this day. A full stop to load up the Hydropack and dunk my head, and then a few words of encouragement to myself and once again I am off. Wasp nest aside, the going had been very good so far. But I knew there was trouble ahead. This next section of the trail past Sombrio is bad running, and I knew this new Southerly direction (uphill) it was only gonna be worse. Yes it was bad, but I faired very well. I coped with the technical part leading up to the old road, and I was able to run the 1k uphill stretch of the road in its entirety. I was pretty bagged at the apex of the climb, but it was certainly fun to travel down this time (rather than up) towards the Loss Creek suspension bridge. I was pretty beat up by the time I hit km 23, but I was super excited to make it to the half way part of the trail without seeing anyone else from the JdF Epic Run. Shortly after though, I saw Ian coming toward me, and I stopped briefly to warm him of the wasp nest at 33.6k. He then told me that he had been stung, as there were two wasp nests around 12 and 13k. Great. I said goodbye, and then saw his running mate Nico shortly behind. It wasn't long before I found the short cut path that led to the ocean, and I opted to get off the trail and get onto the beach. The trail had beat me up enough. This was, in hind sight, a bad move. The tide was much higher than I anticipated, and the short cut proved to be no time-saver. The sea arch that I would normally go through was now in the ocean, and I was forced to scale some rocks and do a 8 foot leap down off the rocks onto the beach. The beach was soft, but I did get to the top end of Chin Beach without injury. Chin Beach was slightly better than Sombrio in the sense that I did manage to jog part of it. At the South end, I saw the 6 members of the running group from Vancouver. They were amazed and excited to see me and they took my photo. They asked what kind of pace I was on and I said 6:15. I knew at the half way point I was at 2:55ish (PB pace), but I also knew the chance of me getting an even split was near nil. I felt good, but I was feeling drained, and the worst part of the trail was about to hit me hard in the face. I left the beach and for a moment I forgot what the trail ahead was like. What is was like was bad. Really bad. Not very runnable, and large elevation gains and drops. I tried my damnedest to cope with the power hiking/run down the switchbacks routine, but simply put, this part of the trail killed me. I felt drained of energy earlier, and this sucked every ounce of energy out of my legs. My hydration was good, my salt was good (I wasn't cramping), but my legs were like Jello. I slowed down with each kilometre, and by the time I hit 14k I was barely jogging. And then I remembered what Ian had told me. There were more wasp nests ahead. Two lady hikers were coming my way, so I stopped to ask them if they had seen any wasp nests. No they said. Whew. I was relieved. It couldn't be that bad, but I should keep my guard up for the next few kilometres. I never saw any nests over the next few kilometres. My pace did pick up over that section, likely out of fear, but I was in pretty bad shape when I hit Bear Beach at the 9k point. Normally Bear Beach is a beach I would consider running. But not today. For one thing, the tide was way up, so the rocks I usually go on were submerged. I was forced high up onto the sand and it was just as well, because I was struggling now. Beach Beach is a long stretch of beach, but when you are walking it in the sand and exhausted, it seems even longer. I was hoping that the beach would revive me. I used the walk to refuel, and I prayed that the Calories would hit me sooner than later. But as I left the beach for what should be a pretty easy section of the trail, I was in the same sad state I was when I entered Bear Beach. I now had all of 8k to go. And I couldn't run at all. I was that tired. Normally 8k would be a snap, but I knew I was in some trouble, and I knew I was on my own, so I had to take it easy. After all, it is the JdF Trail and most people spend 1 day to hike to Bear Beach. So I walked. And boy did the kilometres go slow. I wasn't paying attention to the clock, but it took a long time to see the kilometre posts. Every once in a while, I attempted to run a flat section, but my effort was for nought. My head was down, my hands were on my thighs and I was doing my best to finish in one piece. I was bonking and bonking bad. There were some of the longest kilometres of my life. At kilometre 3, I decided to sit down, as my stomach was a bit queasy and I was in rough shape. I took my final gel and finished off my water. Still no cramping, but zero energy to move the jello legs. It was only 2-3 minutes before I began again, and I was relieved to get to Mystic Beach shortly after. Mystic Beach was full of people. And the people seemed to give me some energy, at least, for the time being. I got back on the trail again after the brief beach walk and climbed up the massive staircase back into the canopy of the West Coast Rainforest. The route was slightly uphill here, but I felt obligated to attempt another run. This time, I held form and was able to shuffle through the last stretch and through all the hikers/walkers. I made it to the end without stopping and clocked my time at 6:19. I was happy to be done. This trail is bloody tough, no matter how many times I've done it, or how many different ways I go. It was a tale of two stories for me this day. The first half was incredible, the second half was dismal. Again, I now am in search of answers. I feel that I had the fitness to continue my pace that I established early on. It was a similar pace to that of last year, but I was beaten by the trail. My hydration was good, my salt intake was good, my Caloric intake or glycogen reserve let me down. Do not go to a wedding the night before a big ultra. You will lose energy. Get more sleep. 4 hours per night is not sufficient. Last year was a pretty good run when I did it in 6:01. This run sucked, and I still got 6:19. So now I am 100% confident that I can do 5:4x if all goes well. I am keen to redeem myself from this day, and I think I may give it another go in a couple of weeks. My fitness is there, and there is room in the racing calendar for it. I should be able to do these distance events and finish on a way better note than this. I hate finishing a run and feeling sour, like the trail beat me. And today, without a doubt, it pounded me. Results will come, but I need to focus on consistency/pace/energy throughout the distance. Ultrarunning is not always glamorous. 1 poo stop, 5 pee breaks, and a nosebleed were highlights for my 40k training run yesterday. Ah yes, and a breakfast of Maltodextrin and Salt, taken in 45 minute intervals. The breakfast of champions. However, at the end of it, it was perhaps the best training runs of 2010 for me. 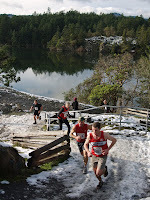 The 40k route took me from Kemp Lake out in Sooke to Leechtown and back. This would be the first time I would run this section of the Galloping Goose Trail, and it is, without doubt, the most scenic part of the trail. The nosebleed came 3 hours into my 3:33 run, and I was fortunate to have Kleenex on hand to plug one nostril while still on the go. So it was a good one for me. No cramping on a 40k run is a rare event for me. I even managed to run all the uphills, which I think is pretty impressive, when you consider a couple of those uphills I took on in the last 5 km. I've now only got one final important training run left. I am planning on doing a 90' hill workout this Thursday at Mt. Doug, just to get a bit more quad endurance in me. The last 4 weeks have been solid though. 4 weeks ago - 4 hours (28k) on the JdF with Sean Chester. 3 weeks ago - 80' (13k) bail out run. 2 weeks ago - 37k to E/B and back. 1 week ago - 40k to Leechtown and back from Kemp Lk. JdF Trail in 2 weeks. I have decided to go for it, and decided to try the North to South option this year. Looking forward to it. Now, on to the real reason I am making this post. Last Thursday, I had the privilege to speak with Gary Robbins over the phone. Although I have never met him before irl, I feel that he and I have much in common, as we share many of the same passions. He is arguably Canada's best ultrarunner at the moment, and 2 weeks ago he set the 75k West Coast Trail Speed Record with a clocking of 10:05. Anyone who truly knows me knows that I am passionate about the WCT, almost to the point of obsession. I was hoping for a WCT Run this year in 2010, but with my injury earlier this year, it never happened. I still have dreams at night of a WCT attempt in 2011.
: Before I begin with the questions I have for you, I just got to congratulate you on setting the WCT Speed Record. : Thanks, it is finally great to chat with you. : And also, when you did the double (WCT/JdF) back in 2007 in just under 24 hours, most people thought this kind of goal was unattainable. I would like to thank you for being such a great role model and making the impossible seem possible. Although you may not know it, there are many runners young and old new to ultrarunning that look up to you as 'the guy' in the sport. : Thanks, I think you have me blushing now. It is humbling to know that others are inspired by me. : Concerning the WCT, I know you left just shortly after 5:30 am at the North Trailhead. Was light an issue at all? : Yes, a little. For that time of the day, I really should have left about 15 minutes later, but I had pre-arranged when to meet the Nitnat Ferry guy - between 9 and 9:10 am - so I had to get to that point on time. : When you got to the beach after the first 12k, were you able to use low tide and run in the ocean on the sandstone shelf at all? : Not really. There were a couple times I went into the ocean, but it was dangerous down there. The terrain was sketchy and the larger rocks were terribly slippery. It was just dangerous, so I was forced onto the beach and the sand for much of it. : So now you motor along to Km 22 where you encounter the first cable car crossing at the Klanawa River. Knowing how difficult these crossing are on your upper body, and how many Calories it takes, would you consider swimming across the river instead? : Out of the 5 cable cars, I only took 2. And yes, the cable cars are pretty brutal, but I would definitely not swim across. There is too much to be lost if your body temperature gets too low, or your gear gets wet or something. While it may be slightly slower, it is just safer to use the cable cars. : So now you bomb along until Tsusiat at Km 26. Did you find the next section after - from Km. 26 to Km. 33 nasty at all? : It is a very technical stretch. : Was the Nitnat guy there for you on time this time around? : Thankfully, yes. I had phoned him ahead of time, and he was happy to show up earlier than scheduled for me. I gave him a twenty and I was on my way. : Were the boardwalks slippery at all for you, or were they pretty dry? : They were pretty good. I know there is usually a heavy mist in the mornings - even on a hot summer day - so they can be pretty bad. I'd say 90% of them were totally runnable. I can't even imagine attempting to run this trail when it is wet. I would never have come close to the record had the weather been different. : You make it half way, to Monique's Restaurant. Did you stop there at all? : Yes, it was a short stop though. I ate my trail mix, I filled up my water, and that was pretty much it. : You now motor along to the Walbran River at Km 53 along the beach. How was that section, and did you manage to ford the river? : The beach was a little slow going I have to say. Some of it was not very runnable, so it tried my patience on more than one occasion. The river (Walbran) was very high, and I decided not to chance it, so I went up to the trail and did the cable car...reluctantly. : Along the final 20k or so, there are a few places where you may have thought about taking the beach instead of the trail. Were you able to fast-track along the beach? : No. It was trail all the way out from the Walbran. I know there are places where the beach may be good, but the tides were not ideal, and the rocks along the beach had already proven to be very slippery. It would have been chancy to take that option. 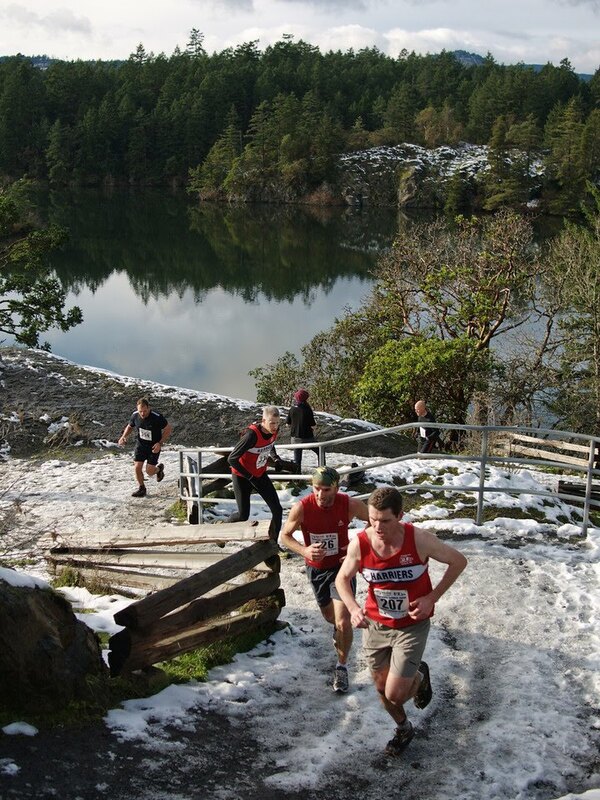 : One of the most difficult parts of the trail is the final 10k. I know the final 5k for you was really bad, in terms of nutrition, but how did you find the km 65-70 section. You know, the loggy section. : It is difficult for sure. Very technical, very slow. : Your GPS showed at the end of the run that the trail was actually 80k, and not 75k. Where was the extra distance on the trail? : The first kilometre was longish (1.2? ), maybe due to the recent storms that the trail had endured. But after that, the kilometre marker were dead accurate for much of the way, until the last 10-15k. The last 5k was more like 8k. : Was finding water on the trail a problem? : Were you disappointed with your 10:08 finish? : No. I came to set the record, and I did that. Yes I could have been faster, and yes I could have done a few little things differently. However, record set, mission accomplished. : You have eluded to the fact that running the trail in the other direction may be easier. : I am 100% convinced that running South to North is easier. Getting that nasty part out of the way when you are fresh has to pay off in the end. Logistics would be easier as well. : Was your nutrition plan any different than when you do other races (ie. Western States), seeing that this trail is so damn technical? : No. I use the same nutrition plan wherever I go. I struggled to fuel properly on the trail, and it was my own fault, and I paid dearly for it in the end. I have never bonked so bad in my life. I am used to refueling on the uphills, but because of the terrain, I couldn't really afford to take my eyes off the trail. Then on the flats, I wanted to run them to make up time and speed. The 80k over-distance and my inability to fuel properly (more gels) toward the end caused my bonking. I typically do 3 gels every 2 hours, 2-4 salt caps per hour and real food sporadically whenever I can. I pretty much budget on taking in 300 cal/hr. : Finally, you know that you were capable of running the trail in 9:30 if everything was perfect. Do you think that the trail can be done sub 9...by you, or by anyone? : Well, the conditions would have to be ideal. I think it might be possible, but the stars would need to be aligned. You would need 2-3 elite guys who are pushing one another the entire way, and perhaps not all of them even finish. The weather would have to be perfect, and the route would have to be the quickest. I think it could be done, but perhaps not for a very long time. Things have been going pretty well on the training front. I managed to keep up running while on family vacation, and at the same time, get in a couple of longer runs. Since returning to Victoria, I was back on form in the TNW speed sessions, which is a good sign. 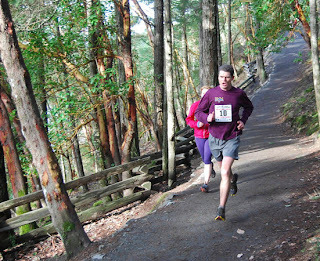 For my long runs, I did Gowland-Tod to Glen Lake (28k) three weekends ago. The next weekend I had the opportunity to do a portion of the JdF, where I ran with Sean Chester and completed 28k in 4 hours. And then this past weekend, I bailed on a 36k training run attempt and turned it into a 13k run. I was ok with this, as there is still time for me to get in a few longer ones. The next two weekends will be critical for me. If I can basically nail two more long (3 hr. ~36-40k) training runs, I should be where I want for the JdF Trail Run on Aug. 29th. I am still unsure if I will run the distance of the trail, or whether I will save myself for the following weekend at the CR 50k. A decision probably will not be made which race will be my "A" race until the day before the JdF. If I'm feeling good though, it will be hard to hold me back! In other news, Gary Robbins does a speed attempt of the 75k WCT tomorrow. This is big news in my world. It is what I have dreamed about for the past 3 years, and needless to say, I am jealous beyond belief. However, I admire Gary to the nth degree, and I am really hoping he has a good showing and crushed the record. I think he will do it. Go Gary, Go! I still have not ruled out of attempting it again myself, possibly next year.